In a shallow baking pan, spread out sesame seeds and celery seeds. Bake in a 300 degree F oven about 10 minutes or until lightly toasted, stirring once. Remove from oven; cool. For dressing, in a screw-top jar, combine oil, vinegar, sugar, ginger, soy sauce, red pepper, seasonings from the flavoring packet of ramen noodles and toasted seeds. Cover and shake well; set aside. 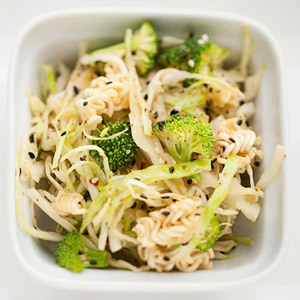 In a large bowl, toss together the broken dry ramen noodles, cabbage and broccoli. Shake the dressing well; pour over the cabbage mixture. Toss lightly to coat. Serve immediately for maximum crispness or cover and chill for up to 2 hours before serving. Makes 8 to 10 side-dish servings.